If your resume isn't generating interviews, it's time for a dose of inspiration. Check out this sample for an entry-level pharmacy technician. If a side effect of your resume is that it isn't generating interviews, it's time for a dose of inspiration, says resume expert Kim Isaacs. 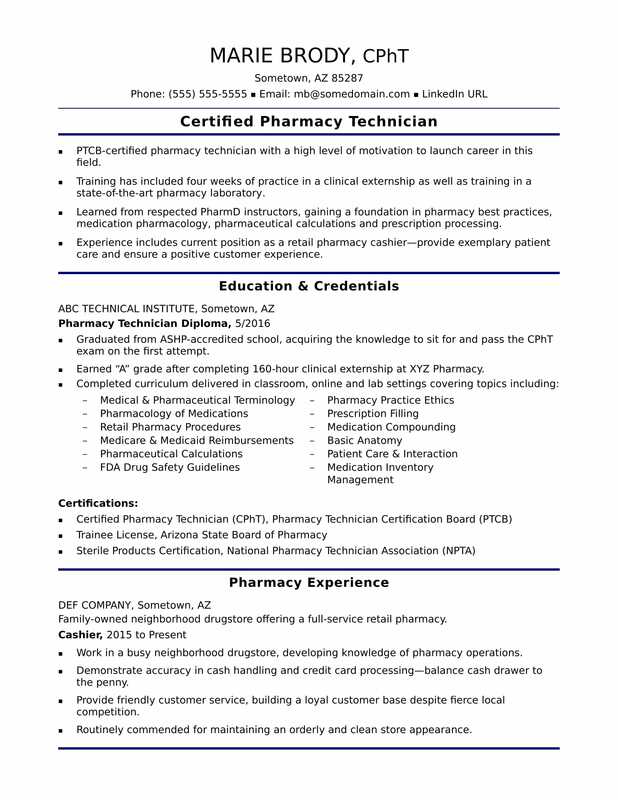 to see how to create a pharm tech resume that gets noticed, view the resume sample for an entry-level pharmacy technician that Isaacs created below. You can also download the entry-level pharmacy technician resume template in Word. And if you need more help, get a free resume evaluation from the experts at Monster's Resume Writing Service. According to the Bureau of Labor Statistics (BLS), jobs for pharmacy technicians are projected to grow by 12% (or 47,600 jobs) from 2016 through 2026, which is faster than average. You'll find the highest level of employment for this job in the following states: California, Texas, Florida, Illinois, and New York; and in the following metropolitan areas: New York City, Chicago, Los Angeles, Houston, and Dallas. Additionally, you can learn more about biotechnology careers on Monster. PTCB-certified pharmacy technician with a high level of motivation to launch career in this field. Training has included four weeks of practice in a clinical externship as well as training in a state-of-the-art pharmacy laboratory. Learned from respected PharmD instructors, gaining a foundation in pharmacy best practices, medication pharmacology, pharmaceutical calculations and prescription processing. Experience includes current position as a retail pharmacy cashier—provide exemplary patient care and ensure a positive customer experience. Graduated from ASHP-accredited school, acquiring the knowledge to sit for and pass the CPhT exam on the first attempt. Earned “A” grade after completing 160-hour clinical externship at XYZ Pharmacy. Family-owned neighborhood drugstore offering a full-service retail pharmacy. Demonstrated accuracy in cashiering, cash handling and credit-card processing, consistently balancing cash drawer to the penny.